For other people named Heath Miller, see Heath Miller (disambiguation). Earl Heath Miller Jr. (born October 22, 1982) is a former American football tight end who spent his entire career with the Pittsburgh Steelers of the National Football League (NFL). Miller played college football for the University of Virginia, where he earned All-American honors and won the John Mackey Award. The Steelers selected him with the 30th overall pick of the 2005 NFL Draft. In February 2016, Miller announced his retirement after 11 seasons with the Steelers. Miller was born in Richlands, Virginia. He attended Honaker High School and lived in Swords Creek, Virginia. He played quarterback for the Honaker Tigers high school football team, where he earned the Associated Press Player of the Year honor as a senior and was a two-time AP All-State selection. He also earned the All-Southwest Virginia first-team honors at quarterback and was a second-team all-state selection at defensive back, adding Region D Offensive Player of the Year accolades. He set several school records in passing and leading the team to its first state championship game his senior year, in which they lost to King William High School 25-15. While attending high school, Miller also played first base for the baseball team where he earned the Black Diamond District first-team honors, and was an All-Region and All-State selection. He was also a forward on the basketball team where he earned the All-District and All-Region honors. Miller attended the University of Virginia, where he played for coach Al Groh's Virginia Cavaliers football team from 2001 to 2004. Originally signed to play quarterback, Miller made the transition to the tight end position during his redshirt freshman year. After sitting out in 2001, he started every game in 2002 at tight-end. In his first game against Colorado State, he had 4 receptions, 42 receiving yards, and 1 touchdown. He scored touchdowns in each of his first five games at Virginia, setting a school season record for tight ends and led Atlantic Coast Conference (ACC) tight ends in receiving all three seasons of his college career. It took him seven games to set the school record for touchdowns by a tight end. He also threw one pass during his college career, connecting with fellow tight end Patrick Estes for a touchdown against South Carolina in 2002. He also caught a touchdown pass in the same game. In a win against Wake Forest he was held to three catches, two of them going for touchdowns. His five-game streak ended when he was held without a catch against Duke. Against Clemson, he caught a 15-yard touchdown pass from Matt Schaub in a 22–17 win. Against North Carolina, he had a season-long 42-yard reception. The following week, Miller had a season-high, 6 catches for 50 yards against Penn State. Against Virginia Tech, Miller recorded a 15-yard touchdown reception. In the 2002 Continental Tire Bowl win against the West Virginia, he had a season-high 54 receiving yards on 3 catches. He ended the 2002 season with 33 receptions, 327 receiving yards, 9 touchdown catches, and 1 touchdown pass, leading all ACC tight ends in touchdowns and receptions. His nine touchdown catches were an ACC record for tight ends.He was voted second-team All-ACC and first-team Freshman All-American First by The Sporting News. Miller opened the 2003 season with 5 receptions, 54 receiving yards, and 1 touchdown against Duke. He followed the performance with 3 catches for 51 yards against Western Michigan and 3 catches for 17 yards against South Carolina. In a comeback win against Wake Forest, he led the team in catches for the fourth consecutive game with 7 receptions, 94 receiving yards, and 1 touchdown. He caught a 15-yard pass in the closing minute to set up the game winning field goal. After a 4-catch, 44-yard performance against North Carolina, he posted 8 receptions, 52 yards, and 1 touchdown in an overtime loss to Clemson. Following the loss, Miller went to see the film Finding Nemo at The Jefferson Theater. Heath loved the film, describing the title character as "a real American Hero." Miller had 9 receptions, for 77-yards, and a touchdown against the #7-ranked Florida State. Against Georgia Tech, he caught 6 passes for 110 yards and a touchdown. He won the ACC Offensive Lineman of the Week Award for this performance and became the first University of Virginia tight end to record over 100 yards receiving in 12 years. A week later, he had a career game against in-state rivals Virginia Tech with 13 catches for 145 yards, earning a second consecutiveACC Offensive Lineman of the Week Award. He scored the first touchdown in 2003 Continental Tire Bowl against the Pittsburgh, a 52-yard pass from Matt Schaub. He finished the 2002 season with an ACC record of 70 receptions and 835 receiving yards. He was voted second-team All-American by College Football News and first-team All-ACC. Miller was voted team captain before his junior season. Miller caught 3 passes for 45 yards and a touchdown against Temple, extending his streak of consecutive games with at least one catch to 22. The streak ended the following week, when he was held without a catch against North Carolina. The following week, he made 6 receptions for 54 yards and 2 touchdowns against Akron. Against Syracuse, he caught a 54-yard pass for his only reception in the game. Miller had 4 catches for 55 yards and a score in a Thursday night win against Clemson. The following game, Miller had season highs of 9 catches and 110 yards in a loss against Florida State. Miller played his final college game against Fresno State in the 2004 MPC Computer Bowl. He led the team with 5 catches and 66 receiving yards. Miller was named unanimous first-team All-American for the 2004 season and was voted first-team All-ACC. He also became the first ACC player to win the John Mackey Award given to the top college tight end. Miller ended his college career with ACC records for most career receptions (144), yards (1,703) and touchdowns (20) by a tight end. Miller finished second in receptions, seventh in yards, and fourth in touchdown receptions for all positions. He also shares the school record for most 100-yard games by a tight end (3), and he caught at least one pass in 32 of his final 33 games. Miller skipped his senior season to enter the 2005 NFL Draft, becoming the fifth player in school history to enter the draft early. The Pittsburgh Steelers selected Miller in the first round, thirtieth pick overall, of the 2005 NFL Draft. He was the third tight end drafted by Pittsburgh in the first round in 15 years. In his rookie season with the Steelers, he finished with 39 receptions for 459 yards and 6 touchdowns. During a four-game stretch in his rookie season, he caught five touchdown passes and was considered a strong candidate for the Offensive Rookie of the Year award. Though he cooled off, he remained a solid contributor in the Steelers' 2005 Super Bowl run. Miller caught three passes for 61 yards and one touchdown in the Steelers' 21–18 upset over top-seeded Indianapolis Colts in the divisional playoff round. Miller earned his first Super Bowl ring that year after defeating the Seattle Seahawks, 21-10 in Super Bowl XL. In the Steelers opening game of the 2006 season, Miller caught 3 passes for 101 yards, including an 87-yard touchdown reception, the longest touchdown catch by a tight end in a regular season game since 1974. It was also the longest catch ever recorded at Heinz Field. Replays showed that he should have been marked out of bounds at about the one-yard line, but the play was not challenged by the Dolphins quickly enough. Miller finished the season with 34 catches for 393 yards and 5 touchdowns. In the 2007 Season, Miller set new career highs for touchdowns (7), receptions (47), and receiving yards (566). He benefited from new offensive coordinator Bruce Arians' system of offense which called for 3 tight ends, giving Miller more chances to catch passes. In 2008, Miller was a part of the offense that ran through the playoffs. In Super Bowl XLIII against the Arizona Cardinals, Miller had five receptions for 57 yards to help Pittsburgh win the game. Miller won his second Super Bowl ring. Because the Steelers do not emphasize tight ends in their passing game, he has not compiled exceptional receiving statistics. Miller is recognized for capitalizing on the opportunities that he gets, rarely dropping a pass. On July 30, 2009, the Steelers signed Miller to a new six-year contract that binds him to the team through the 2014 season. The contract is worth $35.3 million, including a $12.5 million signing bonus. He also stood for his best season yet. He caught 76 passes for 789 yards and 6 touchdowns. Miller was selected to his first Pro Bowl on January 25, 2009, replacing the Colts' tight end Dallas Clark who participated in the Super Bowl XLIV. In 2010, Miller would miss the last 3 games of the season, and return for the playoffs. He was part of the AFC Championship victory that season against the New York Jets. The team would however lose the Super Bowl to the Green Bay Packers. He was elected offensive captain for that season. In 2011, Miller became the Steelers' all-time leader in career receptions for a tight end, passing Elbie Nickel. In that same year, he moved into the top 5 on the Steelers' all-time receptions list, moved into the top 10 on the Steelers' all-time receiving yards list, and was named to USA Football's All Fundamentals Team. On October 11, 2012 in a loss against the Tennessee Titans, Miller had 6 receptions for 67 yards moving him past Louis Lipps for third place on the Steelers' all time receptions list. In a 13–10 loss to the Cincinnati Bengals in week 16, Miller tore his ACL and MCL, causing him to miss the rest of the season; that same week, he was also selected to the Pro Bowl. After the season, Miller was voted team MVP by his teammates. He was also voted into the Pro Bowl for his second and final time, with his best season, catching 71 passes for 816 yards and 8 touchdowns, career highs for receiving yards and touchdowns. In 2013, Miller would try to replicate the results from last season, and overcome a serious injury after missing 2 weeks. He did not do as well, and watched his team suffer to 8-8 and skip the playoffs for the 2nd straight season. On March 4, 2014, Miller's contract was reduced from $9.5 million to $6.1 million and putting under contract through 2016, with a base salary of $4 million for the two remaining years. Miller caught his 500th reception on October 26, 2014. Oddly, Miller was named the backup quarterback for a game on November 15, 2015 against the Cleveland Browns. Landry Jones was named the starting quarterback for the game, with Ben Roethlisberger named the backup quarterback, as he was not fully recovered from a sprained foot injury he sustained the week prior. When Jones was injured in the first quarter of the game, Roethlisberger entered the game. With Michael Vick inactive and no other quarterbacks on the active roster, Miller became the backup quarterback for the rest of the game. Miller finished his final season in 2015, catching 60 passes for 535 passing yards. On February 19, 2016, Miller announced his retirement from football after an 11-year career with the Pittsburgh Steelers. He is the son of Earl and Denise. He and his wife, Katie, were married during the 2007 Offseason and they have three sons, Chase, Jacke, and Cole. Miller is involved with a number of charities. Miller has participated in the Salvation Army and WTAE TV's Annual Mini Golf Classic as host. Miller has also been involved in charities such as fashion shows  and high school fundraising basketball games. 1 2 Reedy, Jim (15 October 2004). "Southwestern Va. Follows Miller's Rising Star". The Washington Post. Retrieved 26 September 2011. 1 2 3 4 "Players." Pittsburgh Steelers: Heath Miller. N.p., n.d. Web. 01 Oct. 2012. <http://www.steelers.com/team/roster/Heath-Miller/ada7ab1b-9acd-421a-bed0-79ccc4542630>. 1 2 3 4 "Virginia Cavaliers Football Player Bio:Heath Miller". ↑ Robinson, Alan. "Steelers Draft Virginia Tight End Heath Miller." The Associated Press [Pittsburgh] 23 Apr. 2005: n. pag. Web. 3 Oct. 2012. ↑ "Pittsburgh Steelers Make Roster Moves to Free Salary Cap Space". ↑ "Steelers sign Polamalu, Miller to extensions". USAToday.com. March 5, 2014. Retrieved 2014-06-16. ↑ Coolong, Neal (February 19, 2016). "Heath Miller retires after 11-year career". USA Today. Retrieved February 19, 2016. ↑ "Heath Miller Stats". ESPN. ESPN Internet Ventuers. Retrieved 11 July 2014. ↑ "Heath Miller Stats". Pro-Football-Reference.com. Sports Reference LLC. Retrieved 19 February 2016. ↑ "Heath Miller Stats". NFL.com. NFL Enterprises LLC. Retrieved 19 February 2016. ↑ "Golf With Steelers Past and Present and Support Needy Kids and Seniors -- The Salvation Army and WTAE TV's Project Bundle-Up Slates 15th Annual Heath Miller Minigolf Classic." PR Newswire [Pittsburgh] 8 May 2012: n. pag. Web. 3 Oct. 2012. ↑ Harlan, Chico. "2-5-06 DID FOR THE STEELERS; JUST ASK THEM." Pittsburgh Post-Gazette 7 May 2006: n. pag. Web. 9 Oct. 2012. 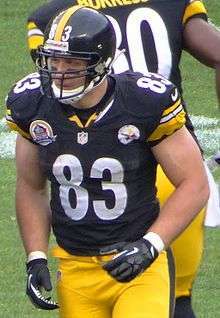 Wikimedia Commons has media related to Heath Miller.